Rakeem Christmas  said he felt sick to his stomach and didn’t want to do anything or go anywhere after his underwhelming game in a loss to No. 4 Duke last Saturday. Syracuse’s (17-9, 8-5 Atlantic Coast) senior big man stuffed the stat sheet, pouring in 29 points to go along with eight rebounds, four blocks and two steals, as the Orange got its first victory over a ranked opponent this season, defeating  the Cardinals 69-59. After mustering only 11 points against Duke just four days prior, Christmas (9-10 from the floor and 11-13 at the free-throw line) rarely missed against the Cardinals. Syracuse, which had struggled against ranked opponents all season, held Louisville under 60 points in a back-and-forth battle that had every trace of a late-season Big East showdown of years past. The Orange’s signature 2-3 defensive zone stifled the Cardinals offense, which was without suspended guard Chris Jones, and held Louisville to 32.1 percent shooting in the second half. “The big difference in the game, between the last four games we played that were against really good teams, was our defense,” Boeheim said. Syracuse entered halftime trailing 32-28, and spent the opening minutes of the second half trading baskets with the Cardinals. Unlike previous games where the offense became stagnant down the stretch, however, Boeheim’s squad didn't let this one sneak away. Down 47-44 with just under 10 minutes remaining, Kaleb Joseph  hit a jumper from the top of the key that ignited a 16-5 run for the Orange which sent the Carrier Dome crowd into pandemonium. Holding onto a six-point lead with just over one minute remaining, Syracuse hit seven timely free throws, a rare occurrence this season, to ensure the Cardinals were held at arm’s length until the final buzzer. Michael Gbinije  continued his hot streak, finishing with 18 points, six assists, five rebounds and a remarkable block on a breakaway dunk attempt by the Cardinals’ Terry Rozier midway through the first half. The Orange junior is averaging 20.5 points, 4.6 rebounds, 4.8 assists, and 2.5 steals over his last six games. Normally the win would be a serious résumé booster for SU’s NCAA Tournament hopes, but a self-imposed postseason ban has made that point moot. Christmas echoed a similar sentiment, deflecting any notion that winning the last handful of games would prove his team’s legitimacy. Rakeem Christmas scores against Louisville Wednesday night. 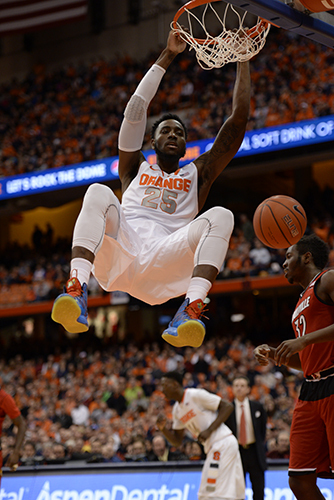 Christmas led The Orange to a 69-59 win over the Cardinals.